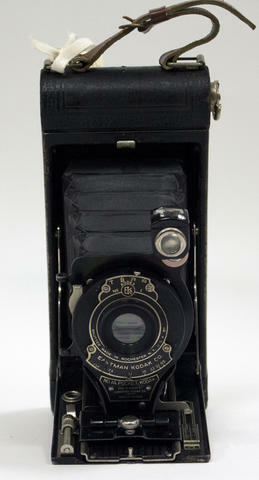 Item is a folding camera for 2 1/2 x 4 1/4 in. exposure on A116 film. The Autographic feature allowed notes to be made on the film by scratching them into the film paper with a special stylus. A window opened in the back of the camera to expose the backing paper. Has a Kodak F-79 lens. The handle has been replaced with a brown leather strip. From the Wilhelm E. Nassau/Wilfrid Laurier University donation, accession number 2011.018. Moved to the Photographic film and Technology collection in 2013. Donated to WIlfrid Laurier University by F.W. Nowak. Item was donated to Wilfrid Laurier University by F.W.